If you don’t already serve lamb for holiday celebrations, this is the year to change all that. Whether you’re serving a cozy dish of slow-cooked lamb shanks with beans or a show-stopping whole-roasted leg of lamb, these recipes will liven up your holiday table like no other. Slowly braised in wine and aromatics, these lamb shanks (served with creamy white beans) are unbelievably tender. Roasted leg of lamb coated in a sweet and tangy honey Dijon makes its own pan sauce along with juicy tomatoes after roasting in the oven. And it’s Garten’s recipe, so you know it’s as easy as it is delicious. 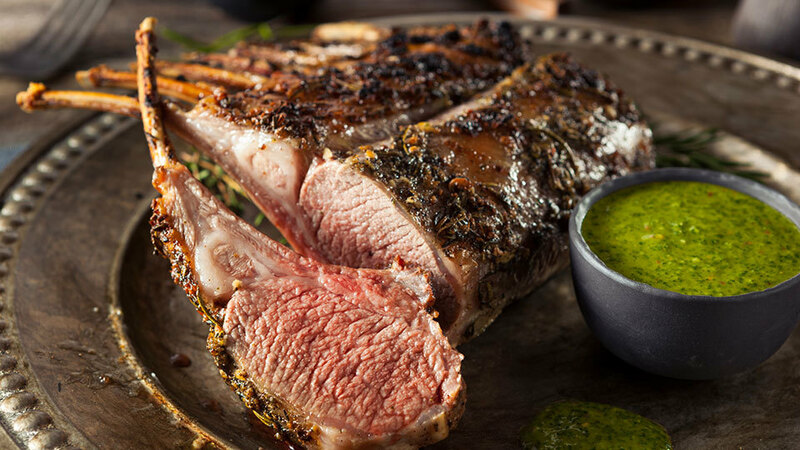 Emeril Lagasse’s crown roast of lamb will have your whole family shouting “Bam!” when they take their first bite. British celebrity chef Rick Stein puts a Greek twist on holiday leg of lamb in this flavorful recipe, in which lamb is cooked alongside potatoes, red pepper and juicy tomatoes, then sprinkled with feta. Jamie Oliver’s four-hour lamb gets special treatment thanks to harissa and lemon, which keep this hearty entrée from feeling at all heavy. A crust of black pepper and garlic paste fills give this rack of lamb a kick of warming spice that’ll keep your taste buds intrigued with every bite. Date glaze spiced with cinnamon, ginger, cayenne pepper and more makes this lamb loin sing with holiday flavor. A full roasted leg of lamb makes a dramatic presentation at your holiday meal, while earthy kale and lots of herbs give it dramatic flavor. Serve with Icelandic yogurt. Bourdain perfected this seven-hour slow-roasted lamb recipe while working at French restaurant Les Halles, and it has all of the rich flavor you and your family crave during the holiday season. Boneless leg of lamb seasoned with herbs, garlic and lemon zest is roasted to a juicy rare in this recipe from Mark Bittman.